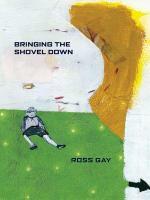 Ross Gay is the author of three books: Against Which; Bringing the Shovel Down; and Catalog of Unabashed Gratitude, winner of the 2015 National Book Critics Circle Award and the 2016 Kingsley Tufts Poetry Award. 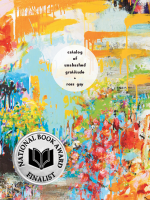 Catalog was also a finalist for the 2015 National Book Award in Poetry, the Ohioana Book Award, the Balcones Poetry Prize, the Hurston-Wright Legacy Award, and it was nominated for an NAACP Image Award. 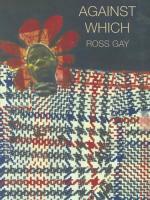 Ross is the co-author, with Aimee Nezhukumatathil, of the chapbook "Lace and Pyrite: Letters from Two Gardens," in addition to being co-author, with Richard Wehrenberg, Jr., of the chapbook, "River." He is a founding editor, with Karissa Chen and Patrick Rosal, of the online sports magazine Some Call it Ballin', in addition to being an editor with the chapbook presses Q Avenue and Ledge Mule Press. Ross is a founding board member of the Bloomington Community Orchard, a non-profit, free-fruit-for-all food justice and joy project. 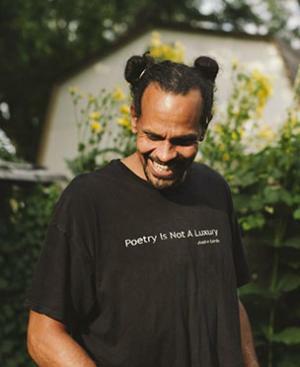 He has received fellowships from Cave Canem, the Bread Loaf Writer's Conference, and the Guggenheim Foundation. Ross teaches at Indiana University. His book of essays, The Book of Delights, was released by Algonquin in February of 2019. 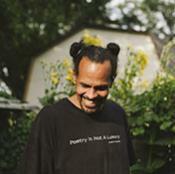 "The Terrible and the Possible: An Interview With Ross Gay"